A New Zealander, Annalucia Vermunt, recently participated in a large communist front gathering in Venezuela. Vermunt is a member of the Communist League's National Committee and its youth wing, the Young Socialists. Vermunt has also been active in the NZ/Cuba Friendship Society and was Communist League candidate for Manukau East in the '96 general election and for the Christchurch mayoralty in 2005. While a "youth" delegate, she graduated from Auckland University in 1988. Formerly, a Trotskyist organisation, known until 1988 as the Socialist Action League, the Communist League has in recent years, realigned itself with the mainstream communist movement and has been participating in international front activities. CARACAS, Venezuela—Hundreds of young people from across the Americas, Africa, Asia, Europe, and the Middle East gathered here August 23-25 for a conference marking the 60th anniversary of the World Festivals of Youth and Students. It was sponsored by the World Federation of Democratic Youth (WFDY), which brings together anti-imperialist youth organizations from around the world. 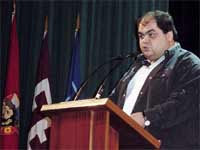 Miguel Madeira, WFDY president and a leader of the Communist Youth of Portugal, reported to the closing ceremony that nearly 1,000 delegates from 70 organizations in 50 countries attended the seminar. The majority came from Latin America, with the largest delegations, several hundred each, from Cuba and Venezuela. Many of the delegates from Cuba were doctors, athletic trainers, and others serving internationalist missions in Venezuela. The Venezuelan delegation was made up of members of the Communist Youth of Venezuela, the National Youth Institute, and activists involved in the formation of the new United Socialist Party of Venezuela, initiated by Venezuelan president Hugo Chávez. From Europe, several dozen delegates represented groups in Belarus, Cyprus, Portugal, France, Hungary, Greece, Germany, and the United Kingdom. About a dozen came from Africa, including from Western Sahara, Namibia, Zimbabwe, South Africa, Angola, and Lesotho. From the Asia-Pacific region, delegations came from India, Nepal, Sri Lanka, north Korea, New Zealand, and the Philippines. The four Middle Eastern countries represented were Lebanon, Syria, Jordan, and Egypt. The first World Festival of Youth and Students took place in Prague, Czechoslovakia, in 1947, in the wake of World War II. Until 1989 most such festivals took place in Eastern European countries where capitalist property relations had been overturned, and participation was largely controlled by youth organizations of the Stalinist Communist parties. “After the change in the world relationship of forces, we asked whether there would there be any festivals again,” said Iraklis Tsavaridis, former WFDY president and secretary of the World Peace Council, at an August 24 plenary session. Harchand Singh, a longtime leader of WFDY from the Communist Party of India, noted that starting at the Havana festival, an International Solidarity Fund was established to facilitate attendance by reducing travel and other costs, especially for delegates from semicolonial countries. The next two festivals took place in Algeria in 2001 and Venezuela in 2005. They were similar in political character and openness to the Havana gathering. At the plenary panel here, other speakers described how the founding of WFDY and the festival movement were marked by the outcome of the second world war. An International Consultative Meeting on the 17th World Festival of Youth and Students followed the seminar. Nearly 100 people from 50 organizations attended. The meeting empowered the WFDY leadership to investigate possible host countries. It resolved to discuss further the next festival site at a WFDY leadership meeting in Portugal in February. Don't Do It, "Uranium Johnny"!